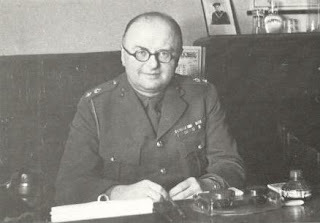 Over a year ago, I wrote a blog post about Lt. Col. William Edward Hinchley Cooke, an MI5 officer who helped catch and prosecute numerous spies during World War II. Hinchley Cooke picked up the nickname "Cookie" during his career, a rather innocent term for such a dedicated and dangerous MI5 officer. While I have been moderately successful in tracing most of the MI5 officers who were involved in the interrogation and prosecution of German spy, Josef Jakobs, two have proved to be more challenging. Lt. Col. Robin William George Stephens, former commandant of MI5's World War II interrogation centre at Latchmere House (a.k.a. Camp 020 or Ham Common) was born in 1900 in Egypt to British expats. After about 1960, however, Stephens' trail runs cold; when and where he passed away is still a mystery. With Cookie, we have the opposite problem. The circumstances surrounding his death are well known. He dropped dead of a massive heart attack in the street outside his home in March 1955. It is Cookie's birth that has been a bit of a mystery, but I've cracked open the case a little bit. A bit of genealogy sleuthing, a fortuitous contact with one of Cookie's distant relatives and... I was able to apply for his British Army Personnel Records. Jackpot! Many authors have noted that Cookie's father was British and his mother was German but beyond that... not much was known. Was Cookie born in Germany or England? I had dug around on Find My Past, searching in the Overseas Birth Registrations for British Nationals, but had drawn a complete blank. However, based on his army records, Cookie was indeed born in Germany and the next step has been to apply for his birth registration from the relevant German archive. Keeping my fingers crossed. A few other interesting tidbits from Cookie's file. Turns out that he was a law student at Gray's Inn in London at some point. His file doesn't indicate that he passed the Bar, so a legal degree was probably not part of his resumé. Still, his law studies do explain why he was so heavily involved in the prosecution of spies during World War II. At some point, most likely in the period between 1922 and 1926, Cookie served in the Secretary's office at Vickers Limited. Vickers was a massive British engineering firm that dabbled in armaments, shipbuilding, airships and aircraft. Cookie's time at Vickers was listed as "Business Qualifications", a skill that would come in useful in running his office at MI5. Given the fact that Cookie was born and raised in Germany, his German language skills were flawless. According to the German Abwehr, Cookie spoke German with a Saxony and Hamburg accent. He also picked up Dutch and French along the way. According to his records, Cookie was classified as a 1st Class Interpreter A.O. for German. His skill in the other two languages was "translator and fluent conversational". On top of that, Cookie had traveled extensively throughout Europe - France, Belgium, Holland, Switzerland, Germany, Austria, Italy, Czechoslovakia and Yugoslavia. Most likely his work with Vickers Limited gave him a good cover story for traveling throughout Europe. Finally, Cookie had trained with the Birmingham City Police "in all matters relating to the administration of a Civil Police Force". Cookie had it all: languages, legal knowledge, police training, military experience, travel background, business skills. Although initially recruited into MI5 in 1914 for his language skills, it was clear that after World War I, Cookie built up a diverse resumé that made him eminently qualified to serve as an MI5 intelligence officer. There still some mysteries. While the army records give Cookie's regimental number for World War II, it isn't the same as what he would have used during World War I. The rather common surname of "Cooke" means that it is challenging to track down references to him in the London Gazette between 1914 and 1920. The Army Personnel records, for example, note that he was twice Mentioned in Dispatches, once in 1917 and then a year later. Even with the exact dates, I haven't managed to track those references down. There is also some evidence to suggest that Cookie served as an interpreter/translator at the war crimes trials in Germany in 1946 and 1947. While his Army Personnel record makes no mention of such a duty, it would not be surprising given his background in prosecution and languages. We know, for example that Carl Ludwig Stirling, the Judge Advocate at Josef Jakobs' court martial, also served as Judge Advocate at the several war crimes trials in Germany (e.g. Belsen). In 1954, Cookie was retired from the Territorial Army having exceeded the age limit. Less than a year later, he would pass away.